pricey (what else would you expect of the spa esprit group? ), but decent lunch/ brunch place for women. that last part isn’t any manifestation of feminism, but an observation that the only men in the restaurant throughout my meal were the ones in the kitchen. this is my second time here, and on both occasions I’ve ordered the mud crab curry papardelle. I’m not sure if this consistency says more about the cooking, the menu choices, or me, but it’s a rich dish that marries the sweetness of crab with a slight, ever-so-moreish heat. you see from the photo that it comes with plenty of crab meat, as well as crispy sage (?) leaves that I wish were more generously sprinkled, because they sure add an alluring fragrance (and flavour). my sister had the red snapper this time, which was beautifully-plated – a thick fillet of fish fried crispy, mounds of barley cooked in squid ink, and other daintily-plated accoutrements. quite delicious, but not quite filling on its own. it’s a nice place, and very well-designed – rather reflective of what the spa esprit group has come to be. I’d recommend lunchtimes here as the sunlight streams in in a most delightful manner, and the yummy mummys create an ambience all of their own. 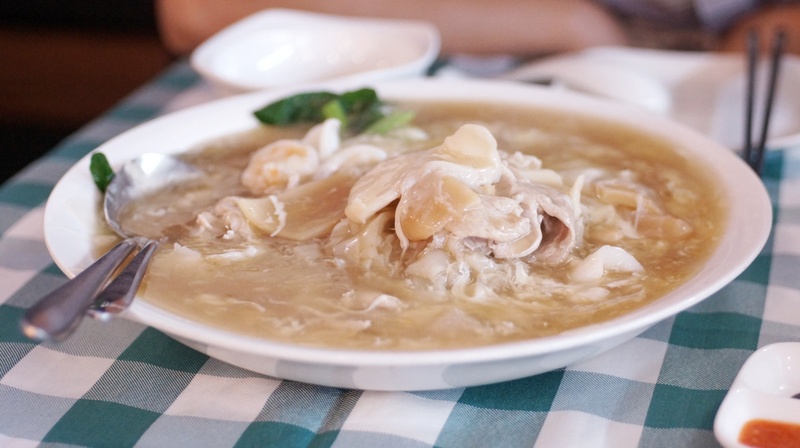 reliable, comforting local cooking (and of course, very good hainanese boiled chicken). boon tong kee is a local institution for chicken rice. 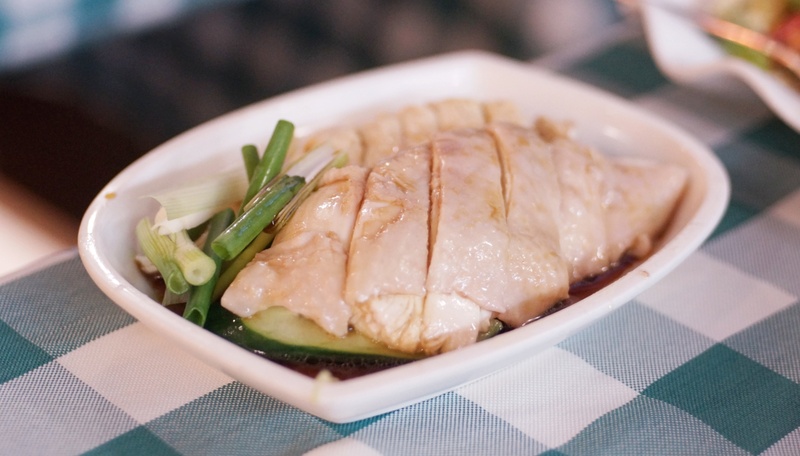 known most particularly for the white, boiled variant of the dish, they serve up plates of tender and juicy chicken that arrive doused generously with a sweet-and-savory soy sauce (that I think could actually be the true star of the show). 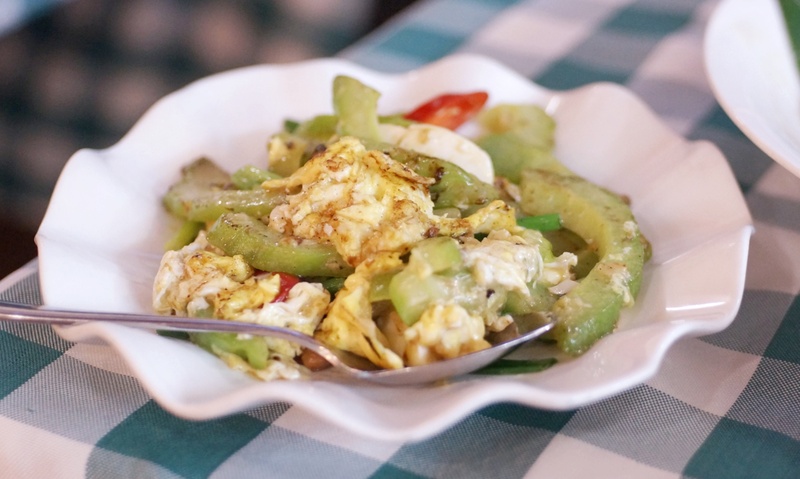 they also do a large range of cooked dishes, or cze char, but these – while decent – tend to run second fiddle to the chicken (and rightly so, perhaps). on this visit, we ordered bitter gourd sauteed with regular and salted eggs (our new favourite thing to order everywhere, also possibly a reflection of increasing age), and seafood hor fun (the thick rice noodles had a hint of wok hei, but were a little gloppier than we would have wanted). definitely a good option for the weekdays. the place is packed at dinner times, and is a good alternative if you had initially planned to visit melben seafood, which is just a couple storefronts down (which was what we had initially come for). the common (and typically, the only) gripe I’ve heard about this place is its price, but hey, let’s not be stingy about paying for local food. satisfying post-work fare. we started a rather pleasant friendship with ramen during our trip to Japan last year – the sort in which you talk whenever you want and there’s no expectation of further commitment – and have come back to Singapore only to be consistently disappointed (most recently, by sanpoutei, which serves up a too-doughy noodle and rather middling charsiu). but the husband recalled a good meal at this joint – and we joined the queue, scoring a table in barely 20 minutes on a Friday night. the dude manning the queue is alternately perfunctory and impatient – but I did manage to figure out that the noodles here come in a few permutations (soba or ramen, wet or dry, rich or clear soup, black pepper or wasabi for spice), with the only constant being the tender chicken leg that peeps out the top of the bowl. tender, seasoned beansprouts (so addictive) and hard-boiled eggs are available table-side – and they complement the al-dente noodles that sit in a (slightly too starchy) flavourful bowl of soup. p.s. bamboo shoots aren’t included in the bowl but are available with supplement – they come in thick, tender strips and are quite good. technically proficient – but as my clever friend puts it, soul-less. you get the keen sense that there is something missing here at pollen. take the restaurant – beautiful, but with an ambiance that falls short of the exclusivity it seems to want to exude (and edges far too close to pretentiousness). the food, too, makes you wonder about the chasm between imagination and execution – there are a great many components that I have no doubt are the result of excruciating effort and exhausting manipulations, but they sit together without heart. we shared both the five-course early dinner tasting and the seven-course degustation menus, and you might like to know that the cooking was consistent (and really, quite skilled) though of course the more expensive menu presents fancier ingredients. I’m not sure any of the dishes really wowed me, although the cherry-looking chicken liver confection was light and tasty (and I don’t even like liver), and the supposedly-vaunted tarte tatin is worth a try if you’ve still got space. I’ve nearly grown out of this poncy manner of eating, and this meal hasn’t convinced me otherwise. it might be a nice place to bring some out-of-town friends that want something fancy after going through our beautiful gardens, but I’ll point you the direction of the altogether more impressive majestic bay instead. I’m (super) late on this one (and many others), and so just a short piece on this place – it was a birthday meal, and we arrived with heightened expectations and a keen sense of disappointment after. while service was lovely, and the place was neat and crisp with its white tablecloths and fancy tableware, we found the food to be just about middling. nothing so bad as to surprise, but certainly not as good as we were led to believe with its longstanding, positive repute. at the long and short of it, we are unlikely to return, especially with Singapore’s large range of excellent Italian restaurants (such as Senso and Gattopardo). no.. that’s not a glass of yamazaki. the eponymous whisky made no appearance at my meal, though a slew of rather (surprisingly) delicious dishes made it onto our table, and very quickly into our stomachs. this place looks pretty much like a tourist/ yuppie trap, with its location at one fullerton and its disarming views across our beautiful marina bay area. 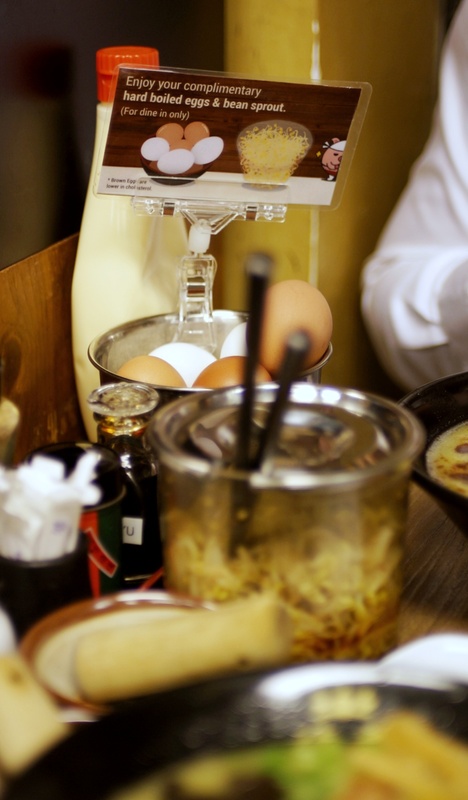 but the food is prepared by bona fide japanese, and there are plenty of japanese clientele to provide credibility to the kitchen (or perhaps the well-stocked bar). slightly pricey, but no more than you’d expect for the location and the slight fine-diningesque feel about the place. you awe me year after year – and may you stay beautiful, strong and resilient. I had the opportunity to attend the first preview parade for 2016 (an excellent initiative on our government’s part to ensure more people get to watch the show every year), our first at the national stadium in years. it was excellent, as always, but I do wish we could have retained the mobile column and the red lion segment. the celebratory song is excellent this year too – catchy and upbeat, and it gets you going. happy national day, everyone! this is one of my favorite places to grab a meal – and even if prices appear to be rising and the portions gradually reducing, and the flavors a little less robust than when I first tried them a couple years ago, it still hits the spot rather perfectly. I love mediterranean/ middle eastern food – and this tiny place on the outside of the marina bay sands shopping mall has a simple menu of a few choice dishes (and various flavored permutations). I tend to order the same thing: hummus, shakshuka, falafel and tabbouleh – all which give you a good spread across both flavor and texture spectrums. the homely falafels are particularly savory and delicious, and any heaviness is offset by the fresh, herbacious tabbouleh (with juicy pomegranate seeds dotted throughout). the red shakshuka tastes better to me than the green – and everything goes quite nicely with the triangles of heated pita that arrive alongside. it’s a simple meal, and a nice way to catch up with friends (or spend some alone time) – it doesn’t get much better than that. ok, ok, I ate here during restaurant week – which was in.. october? WHERE HAS THE TIME GONE?! decent food, good view, quiet cosy-type environs all done up in dark tones – it’s a safe choice for dates, and its location in the CBD is plenty convenient. I will say though, that the photographs of zafferano are a little nicer than the actual restaurant is, but at least the food and service pass muster. and – they have a stellar tenderloin on offer that was quite utterly delicious. cute little wine bar hidden away in telok ayer run by a legit frenchman, filled with an impressive number of wine bottles and plenty of artwork with (slightly lame-o) alcohol-derived puns. they serve plenty of nibbles and mains here to go with your glass of wine – but beware: the sharing plates aren’t small, and the well-seasoned, rich flavors almost necessitate sharing. take the home-made terrine of foie gras, for example, which had the goose liver mix served with fig chutney, a balsamic reduction and a small roll of bread. this is plenty rich, and slightly overwhelming in such a large portion (large for me at least, since I do not favor the liver), but that chutney was delicious and helped to keep the dish fresh. the hand-cut angus beef tartare was perhaps my favorite starter: served with a raw yolk, capers, and crunchy diced white onions. stir in plenty of pepper, mustard and just a touch more salt, and it is delicious. crispy hand-cut wedges came on the side, flavored with parmesan and truffle. all in all, super moreish. the angus beef tenderloin has that same meat seared pink and served with a creamy gratin dauphinois, ratoutouille and a red wine sauce. but the carrot puree that arrived bright orange was the star of the show: soft, silky, and very pure-tasting (though the texture is slightly reminiscent of baby food). the shrimp truffle capellini felt particularly asian, especially with those bits of salted seaweed strewn throughout. the noodles were well-cooked, and there were plenty of shrimps to break up the texture – it’s a nice fusionesque dish, and a light-tasting option if you’re looking for some substance. but if you’re in for something rich, the lobster risotto is definitely the way to go. it was a particularly creamy (and wet) rendition, with tender grains of acquarello rice and al dente asparagus dice to break up the texture. and I haven’t even mentioned the lobster, which comes in nice thick slices and as sweet as you’d want. the last part was definitely the best – but how can you go wrong with chocolate? a mi-cuit (half-cooked) canelle – I have never had one like this before – that had an oozy, oozy, molten centre, next to good vanilla ice cream and coffee crumbs. not to forget the slab of chocolate ganache though, and my goodness was that fudgy and rich and good. it’s a small piece of parisian bistro in sunny singapore, and a very nice one run by a friendly frenchman. they know their food here, and it’s a lovely place to grab some wine after work on the weekdays. definitely one to try. thanks to the entertainer and napoleon for the lovely meal and wine!